The Soyuz rocket with Expedition 33/34 crew members, Soyuz Commander Oleg Novitskiy, Flight Engineer Kevin Ford of NASA, and Flight Engineer Evgeny Tarelkin of ROSCOSMOS onboard the TMA-06M spacecraft launches to the International Space Station on Tuesday, October 23, 2012, in Baikonur, Kazakhstan. Ford, Novitskiy and Tarelkin will be on a five-month mission aboard the International Space Station. A Russian Soyuz spacecraft is closing in on the International Space Station and on track for a Thursday arrival (Oct. 25) that will ferry three new residents to the orbiting laboratory. The Soyuz TMA-06 space capsule is slated to link up with the space station at 8:35 a.m. EDT (1235 GMT) to deliver American astronaut Kevin Ford and Russian cosmonauts Oleg Novitskiy and Evgeny Tarelkin to their new home in orbit for the next five months. The trio will join three other crewmembers already living aboard the station, doubling its population to its full six-person crew size. Expedition 33/34 crew members, Soyuz Commander Oleg Novitskiy, bottom, Flight Engineer Kevin Ford of NASA, and Flight Engineer Evgeny Tarelkin of ROSCOSMOS, top, wave farewell before boarding their Soyuz rocket just a few hours before their launch to the International Space Station on Tuesday, October 23, 2012, in Baikonur, Kazakhstan. You can watch the space docking live on SPACE.com here via a NASA TV feed. The NASA broadcast will begin at 8 a.m. EDT (1200 GMT). Ford, Novitskiy and Tarelkin launched into orbit on Tuesday (Oct. 23) atop a Soyuz rocket that lifted off from the Central Asian spaceport of Baikonur Cosmodrome in Kazakhstan. They form half of the Expedition 33 crew on the International Space Station, which is commanded by NASA astronaut Sunita Williams. Japanese astronaut Akihiko Hoshide and cosmonaut Yuri Malenchenko round out the crew. There are more than three human explorers arriving at the space station, too. A group of 32 small medaka fish hitched a ride into space on the Soyuz and are bound for a fish tank on the station as part of an experiment to understand how fish adapt to microgravity. Williams said she also planned to save some ice cream for the new station crewmembers. The ice cream, a rare treat for space crews, was delivered to the space station earlier this month aboard a private Dragon space capsule built by the Hawthorne, Calif.-based company SpaceX. The Dragon capsule is flying the first of 12 commercial cargo missions to the station under a $1.6 billion contract between NASA and SpaceX. Thursday's Soyuz docking will come during a busy period for the space station crew. On Sunday (Oct. 28), the unmanned Dragon space capsule will depart the space station to ferry a load of experiment results and other gear back to Earth. It is expected to splash down in the Pacific Ocean off the coast of Southern California on Sunday afternoon, NASA officials said. On Wednesday (Oct. 31), an unmanned Russian cargo ship will delivery another load of cargo, fresh food and other treats to the space station just in time for Halloween. One day later, on Nov. 1, Williams and Hoshide will venture outside the space station in a spacewalk to fix a slight ammonia cooling system leak on a radiator. Williams, Hoshide and Malenchenko are nearing the end of their months-long mission in space. The three spaceflyers launched in July and are due to return home on Nov. 12. Once they return home, Ford will take charge of the space station as the commander of its Expedition 34 mission. 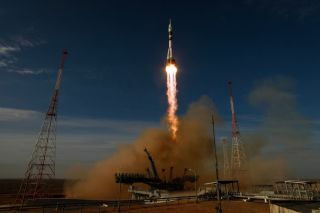 NASA currently relies on Russian Soyuz vehicles to launch American astronauts into space and returning them to Earth. The U.S. space agency retired its space shuttle fleet in 2011 after 30 years of service, and plans to launch Americans to the station on new privately built U.S. spacecraft once they become available.